The `battle for Beijing` is universally - and quite wrongly - believed to have been about opium. This book argues that it was about freedom to trade, Britain`s demands for diplomatic equality, and French demands for religious freedom in China. Both countries agreed that their armies, which repeatedly prevailed over Chinese ones that were numerically superior, would stay out of Beijing itself, but were infuriated by China`s imprisonment, torture and death of British, French and Indian negotiators. At the same time, the British and French also helped the empire to battle rebels and to pocket port and harbour dues. They steered carefully between their political and trading demands, and navigated the danger that undue stress would make China`s fragile government and empire fall apart. If it did, there would be no one to make any kind of agreement with; much of East Asia would be in chaos and Russian power would soon expand. 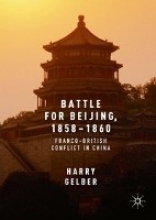 Battle for Beijing, 1858-1860 offers fresh insights into the reasons behind the actions and strategies of British authorities, both at home and in China, and the British and French military commanders. It goes against the widely accepted views surrounding the Franco-British conflict, proposing a bold new argument and perspective.